I imagine you’re as busy as we are right now in preparation for Mother’s Day. 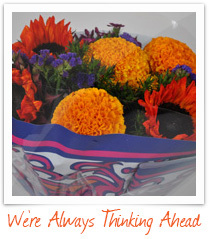 Interest in Sunflower bouquets and bunches is leading the charge – a little higher than expected, actually – and we’re thrilled and doing everything in our power to deliver as close to 100% as possible. Recent rain and May gray has made life around here a little more interesting, but that’s the way we like it! From now until May 13 all hands are on deck to make sure your order is filled with the quantity and quality you expect and we demand. Please contact me directly if that’s not the case. We’re always looking for ways to make flower-friendly holidays better and easier for our clients, andthis spring is no exception. Aaron Motola, Marco Rivera and their teams worked hard in recent weeks on significant enhancements to our popular “Just Add” program. I’m pleased to introduce our new “Just Add Enhanced” selection. 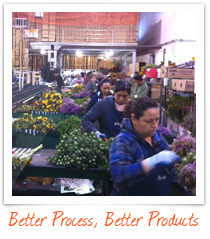 We went straight to the source for this one, visiting several grocery stores and speaking with many floral managers in an attempt to understand what happens with “Just Add” bunches from the time they arrive at a back dock until they leave the store with a satisfied consumer. Then Aaron Motola spent 40 hours working in the store to better understand the department’s needs. Lastly, we went a step further and invited one of these in-store designers to the Dos Gringos Design Center to work with us on recipes. How’s that for teamwork! We identified and immediately put in place some packing modifications that protect the product better and reduce waste. 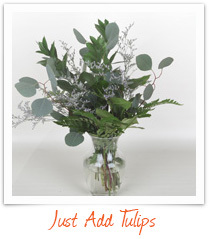 And we bulked up the contents, adding Leather Leaf and more filler greens to rim a vase and ensure a “complete” look for higher-priced arrangements. 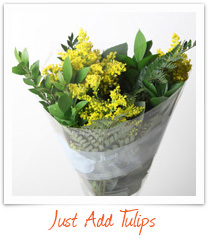 “Just Add Enhanced” is a time saver at the store level and a great value for our valuable floral managers. I can’t wait to see what we come up with next as we continue to reach out and partner with each other. Robin Mooney, our designer guru, has been equally busy making her creative mark on our products. She’s worked shoulder-to-shoulder with our Business Development Managers to learn what’s really capturing attention and to ensure we offer a diverse selection with something for everyone. The summer collection is all about color – the brighter, the better! And there are several new twists, including Bear Grass loops, color enhancement, and glitter. Nice. From botanical to summer shimmer, Robin has it covered – including red hot 4th of July bouquets that are sure to make sparks fly! 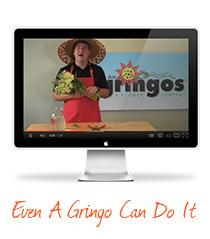 On the client education front, please check out our new “Even a Gringo Can Do It” tutorials on our you tube channel. The team and I are sharing all we know about flowers and greens to help you make the most of every product and gain customers for life! 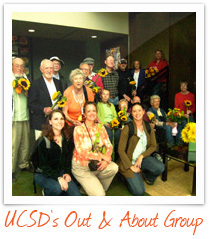 Dos Gringos is pleased to provide tours for the UCSD Alzheimer’s Disease Research Center’s Out and About Group. This picture is of our third tour group. Joan Saunders conducts the tour and Suzy Long does a bouquet presentation. Research has shown that during memory loss, people retain emotional connections longer. UCSD advises us that the groups really benefit by these tours and remain enthusiastic for a week or so following their visit. 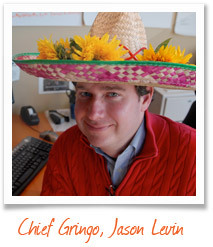 Hopefully everyone had an awesome Cinco de Mayo because we sure did. 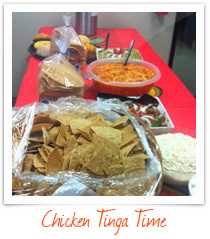 Our team at Dos Gringos celebrated with the traditional dish of Chicken Tinga which was a huge hit.